Courtney McDermott is originally from Iowa, but she currently lives in the greater Boston area. 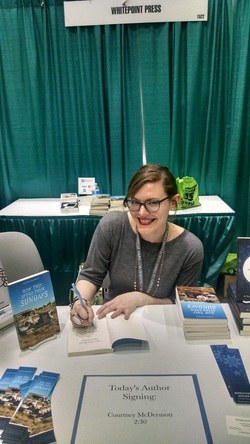 She is a graduate of Mount Holyoke College, and the MFA program at the University of Notre Dame, where she was recognized as the 2011 Distinguished Student in Creative Writing. Her focus is on fiction and creative nonfiction, but she also writes plays, poems, and stories for children. Her first book, How They Spend Their Sundays, is a collection of short stories placed in Lesotho and South Africa. It was released by Whitepoint Press in September 2013, and nominated for both the PEN/Hemingway Award and The Story Prize. She is working on several projects right now, including a novella about a mathematician with PTSD, and a novel about small-town Iowa that is both a coming-of-age story and a mystery. She is the Program Administrator for Film and Media Studies at Tufts University, and she teaches in the online Master's in English-Creative Writing program at Southern New Hampshire University.